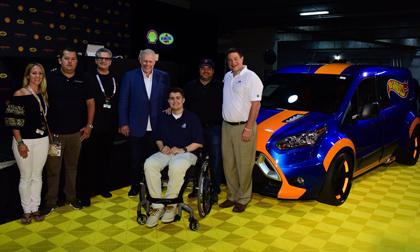 DEARBORN, Mich., June 25, 2017 – The “life-size” Hot Wheels® 2014 Transit Connect donated by Ford to the Darrell Gwynn Quality of Life Chapter of The Buoniconti Fund to Cure Paralysis was sold to Aaron Lawyer of Lawyer Garage for $50,000 on June 24, 2017, during the 2nd Annual Barrett-Jackson Northeast Auction at Mohegan Sun in Connecticut. Hall of Fame drag racer Darrell Gwynn accompanied the custom van on stage, lending star power to the charity sale. The winning bidder directly paid The Darrell Gwynn Quality of Life Chapter of The Buoniconti Fund to Cure Paralysis for the van as Barrett-Jackson does not collect any fees for the sale. Led by the former drag racer, the charity focuses on quality of life initiatives, including wheelchair donations, and raising funds and awareness to support The Miami Project to Cure Paralysis, which conducts cutting edge discovery, translational, and clinical investigations targeting spinal cord and brain injuries. The Hot Wheels Ford Transit Connect was introduced at the 2013 SEMA show and was exhibited in various shows nationwide. It features an entirely custom, euro-look wide body kit, Rotiform ROC wheels, sleeping quarters and tool storage with slide-out drawers for Hot Wheels cars.It has gullwing doors and two Hot Wheels orange tracks recessed in the bed, forming a drag strip in the van. Mattel, which offered a 1:64 scale model of the vehicle, supported the sale of this charity vehicle. Mr. Lawyer will receive a case that demonstrates the process to create the 1:64 model from Mattel, as well as an invitation to tour their Southern California studio. That package includes a personal meeting with the designer team who create Hot Wheels vehicles (transportation not included).